I hadn't quite figured out what I was going to talk about (it's always easier to suggest a topic to me), but I was playing with a Perl 6 data dumper sorta thing I'm calling PrettyDump. I whipped that into shape so I could create a talk about it. 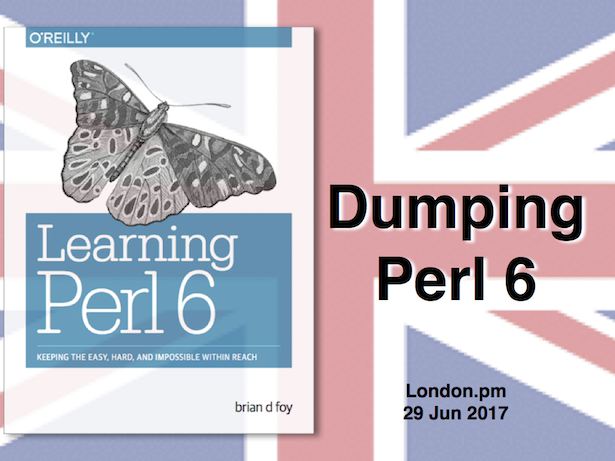 The task by itself isn't so interesting, but seeing the Perl 6 on the inside makes it interesting to people. It's not just me passing on information to other people either. In Amsterdam I was able to meet with Wendy and Liz, which always helps, and talk to Andrew Shitov about this first Perl 6 book, Perl 6 at a Glance. (Yeah, I said "first"). A couple days later at the French Perl Workshop, I got to meet with Laurent Rosenfeld, author of Think Perl 6. These non-directed and casual exchanges with other authors help quite a bit.